It is a brisk and sunny Sunday afternoon in Orlando. I am sitting on my patio dressed in a sweater. These are the days I savor. I must say that January, February and March are my favorite months of the year here in Florida. Those living in the North right now would beg to differ with me, but geographically, these months come bearing a plethora of lovely gifts from Mother Nature. It’s not too hot. It’s not too cold. Spring is tangible. I can envision my lawn coming back to life. I look forward to planting new pots of herbs with my husband, Wayne, to replace what the harsh cold has taken. So why do I love January? Because January here is Summer up North with it’s horn of plenty of locally grown fruits and vegetables. I visited my favorite produce stand, Clemons, last week and was greeted by more than 20 varieties of locally grown produce and fruit. 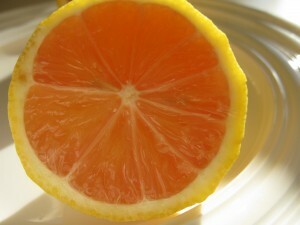 Of course, citrus is plentiful right now. But rarely, does one think of Florida as a “garden state”. The Florida connotation is usually beaches, palm trees, and Disney World. Surprisingly, however we grow a lot of wonderful produce in the winter months. 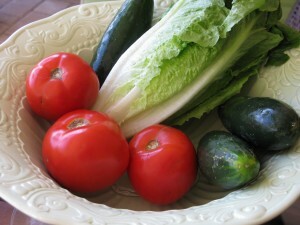 I bought fresh Romaine, cucumbers, and beefsteak tomatoes all grown just an hour or two from my door. Clemons is one of the only places I know that brings the produce from farmer to your door without the middle man. 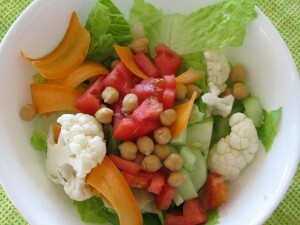 The salad pictured here is one I made for Wayne and I for lunch yesterday. It is Florida fresh. 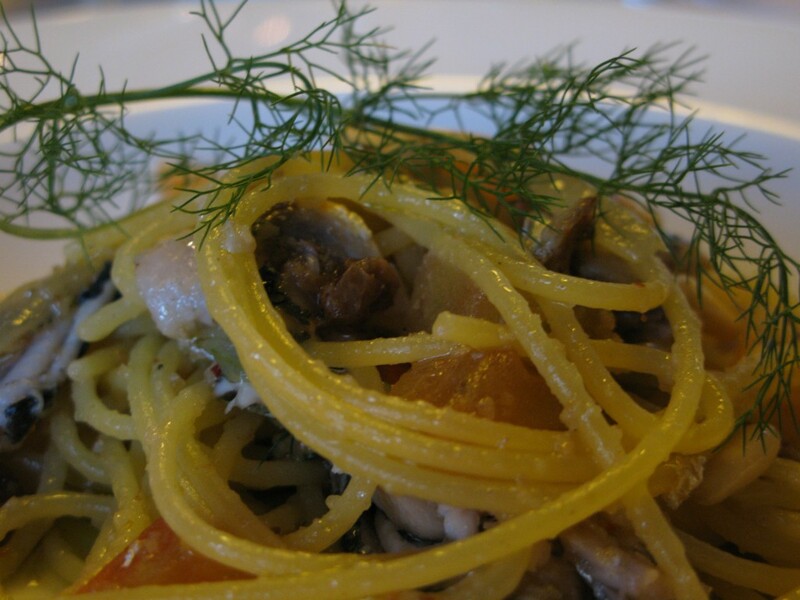 It tasted fresh and perhaps, it is my imagination, but it looks a lot fresher as well. It thrills me to know that I am eating something that did not travel very far to reach my plate. 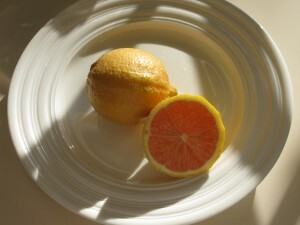 And the lemon pictured here is from our lemon tree in the back of our house. The breeze just kicked up as I sit on the patio on this wondrous January afternoon. I love the combination of the warmth of the sun on my skin and the cool breeze on my face. I suppose, in many ways, I share the same sentiments as my optimistic Northern friends who peer out the window at the snow piled high and hold onto their dreams of the first harbingers of Spring. January arrives with its counterpart of a new year and a unique joy from thoughts of rebirth and renewal and fresh starts. January fills our hearts with new perspectives and new attitudes. January is one of those months that grabs your attention in the moment, but at the same time, taps you on the shoulder to remind you of all the things your heart will be rejoicing about…..very, very soon. I’M BACK! I apologize that I have been away for a long time now and haven’t been blogging or visiting your blogs. I missed all of you! Thank you for all of your wonderful comments and interest in my blog. 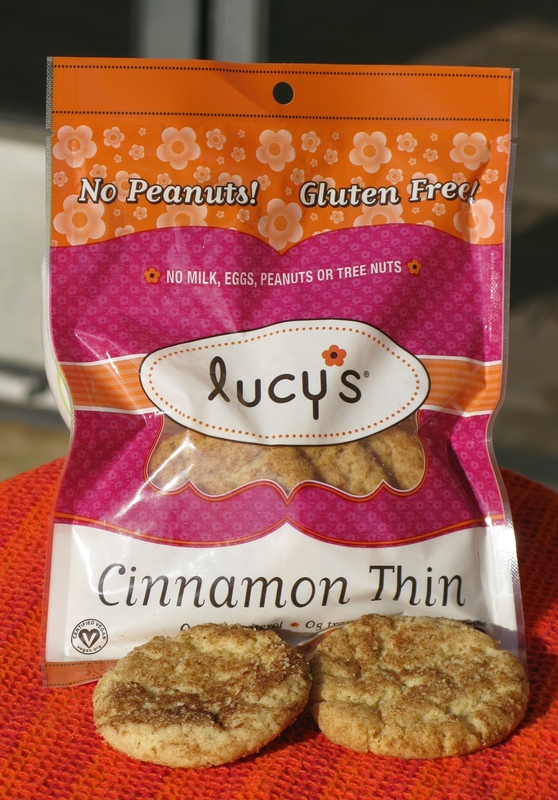 Lucy’s Gluten Free Cookies are my latest great find. Once you taste them, you will want to tell the world. I stumbled upon them one evening on the way home from work at Starbucks. Yes, Starbucks! I am happy to say that Starbucks offers a nice little assortment of “gluten free snacks” for the so inclined. A Starbucks latte is my little reward at the end of my work week. As I near home after my hour long drive, I pass a Starbucks and my car is on autopilot for a coffee treat. As I waited for my latte to be prepared, I checked out a basket next to the register filled with snacks, and it was then that I discovered Lucy’s Cinnamon Thins. I had no expectations. I opened the small package. It contained 4 small thin cookies with a light fragrance of cinnamon. I bit into one and it was at that moment that I fell in love. They melt in your mouth! I am hooked. Turns out that these delectable cookies were formulated by a doctor and mother named Dr. Lucy Gibney. She came up with these cookie recipes for her child who has serious food allergies. 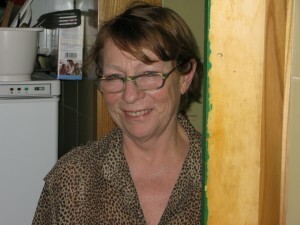 Check out her website: http://www.drlucys.com. They say that necessity is the mother of invention, but in this case this wonderful, loving mother was inspired to invention. Being gluten intolerant, I have not indulged in breakfast cereal in a long time. Most of the gluten free ones are like eating Styrofoam floating in milk, so I had humbly crossed that option off my breakfast choices. I must admit, however, that I missed cereal now and then, because it is so refreshing in the morning with some cold milk, and also, I missed the fact that here was a wonderful way to get some “fiber” into my diet. Then I recently read about Rice Chex becoming gluten free. Like every other gluten free person, I became very excited about this. I don’t know whether I was excited about that fact that they had become gluten free, or that I could actually walk down the regular cereal aisle in the supermarket (and it is a big one at that), and find a gluten free cereal choice. So, during my next food shopping excursion, I perused the cereal aisle, and lo and behold, there they were, Gluten Free Rice Chex. I picked up the box and read all the ingredients and nutritional value box. I was a bit disappointed, as this product clearly lacks fiber and has added refined sugar as well as the preservative, BHT. 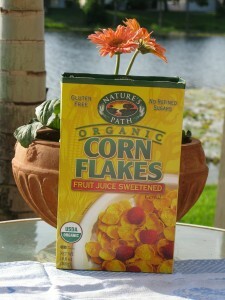 I walked over to the Greenwise section of my market (Publix has a separate area for natural and organic foods), and discovered Nature’s Path Organic Corn Flakes. They offered 2 grams of fiber per serving as well as organic ingredients with no preservatives and the promise of organic. Now in my heart, I just knew, even without tasting them, that the Rice Chex were going to taste good. I was taking a gamble with the corn flakes. You, being gluten free, are quite familiar with being at this crossroads. I did not dare say to myself, “How bad can they be”? I urged myself to be optimistic. I brushed out of my mind the usual little balloon over my head that would have imagined a bowl of tasteless wood chips floating in cold milk. 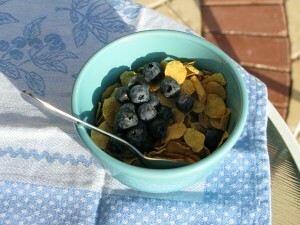 This morning, I poured myself a bowl of Natures Path Gluten Free Corn Flakes. I topped it with fresh blueberries. I used Almond Milk and just a teaspoon of Half and Half cream in lieu of milk. I just love the unsweetened Almond Milk. It is gluten free and makes some awesome smoothies. Yes, the corn flakes are delicious. They are crisp and full of flavor, and they clearly lack that odd preservative flavor. They are a hit and I am as excited, if not more excited, than everyone else who became excited about the Rice Chex. I proceeded to visit the Nature’s Path website, and they do offer many other cereals that are gluten free, including some “rice” versions. Will have to try some of those too. 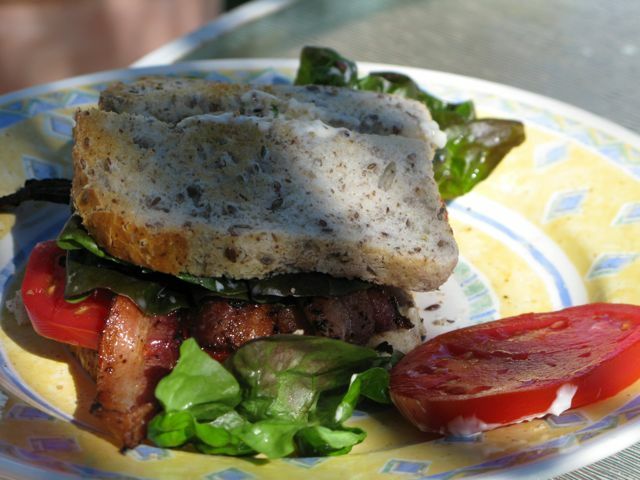 In retrospect, it is truly a matter of choice and taste based on so many variables. I am sure you will agree. As for me, I could use some extra fiber in my life and I don’t need a lot of BHT, so I suppose I won’t be “chexing” any time soon. And it you haven’t already, “chex” out some Natures Path cereals. 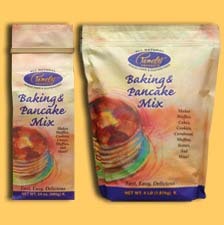 I make all kinds of thing out of Pamela’s Pancake Mix, however, the pancakes are one our favorites. 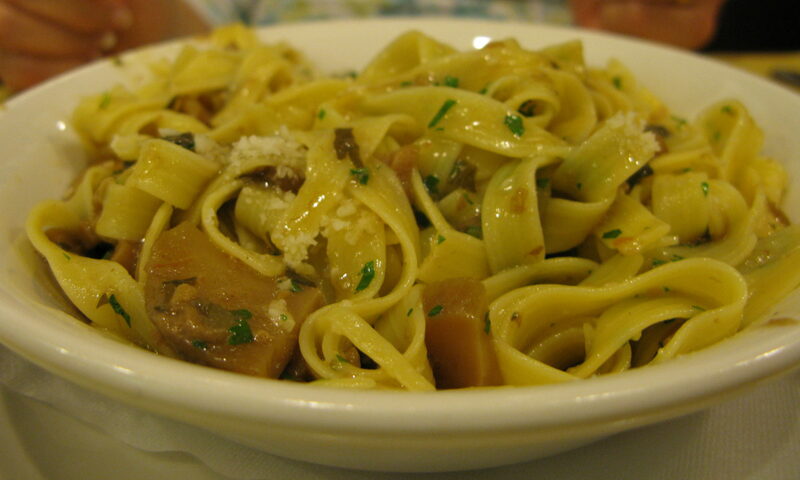 They come out fluffy, light, a lovely brown, and with a slightly nutty flavor. So delicious with any of your favorite fruits added. 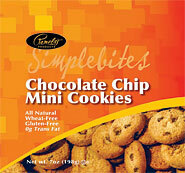 This is an amazing gluten free product that you must try, if you have not already. Get out the griddle and smack your lips. You are in for a delicious surprise.